Solvang is a city in Santa Barbara County, United States. It is one of the communities that make up the Santa Ynez Valley. 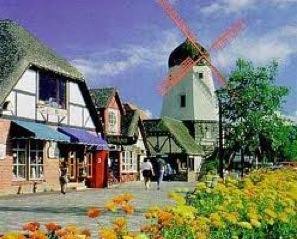 The population was 5,245 at the 2010 census, once just a village, Solvang was incorporated as a city on May 1, 1985. Solvang was founded in 1911 on almost 9,000 acres. The city is home to a number of bakeries, restaurants, and merchants offering a taste of Denmark in California. The architecture of many of the facades and buildings reflects traditional Danish style. There is a copy of the famous Little Mermaid statue from Copenhagen, as well as one featuring the bust of famed Danish fable writer Hans Christian Andersen. A replica of Copenhagen’s Round Tower or Rundetårn in the scale 1:3 was finished in 1991 and can be seen in the city centre. Solvang enjoys lots of sunshine throughout the year with clear, warm days and cool nights. Average temperatures vary between 54 and 76 F.
Solvang has become a major California tourist attraction, with over one million visitors per year.